At HEXUS we are always on the lookout for the ultimate in PC gaming peripherals so it's interesting to see new products that claim to be just that. 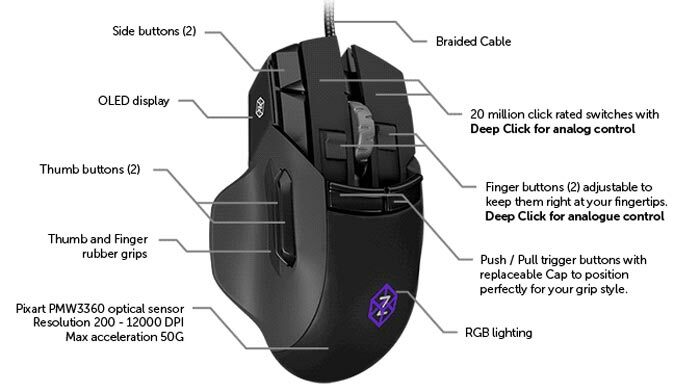 A Kickstarter project has kicked off for 'The Z' which is claimed to be "The most advanced gaming mouse ever made." The funding goal was $140,000, and the SwiftPoint team have almost got double that, garnering around $230,000 in pledges with a month left to go. What is behind the success of 'The Z', its attractiveness? Beyond the boast of being the most advanced, SwiftPoint claim that 'The Z' will enable faster, more precise, and more intuitive interactions with your computer. To start with it's got some big numbers – "80 mappable button actions". Wow, that's a lot, but the actual physical button count is 17, as the 80 button actions are created combining button clicks, triggers and deep clicks combined with pivot, tilt and roll actions. 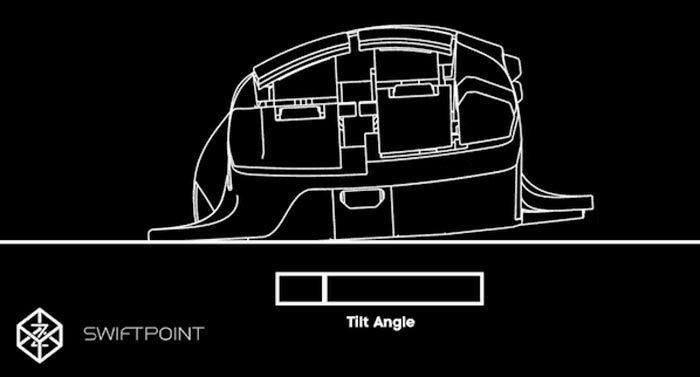 From looking at the video, I would say that the pivot, tilt and roll of the mouse are important USPs of this device. Using them to control screen movement looks quite natural, as is using them in combinations with clicks to invoke different commands. The pressure sensitive switches are claimed to bring further dimension to your control. 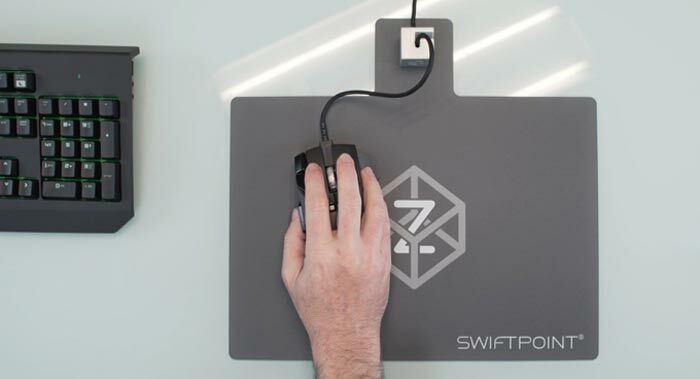 It's interesting to see how SwiftPoint details using 'The Z' in productivity too – have a look at the Kickstarter page. Other hardware in The Z includes an OLED display. The mouse recognises the gesture of picking it up to look at the OLED screen and automatically goes into config mode. There you can change profiles, DPI and other settings. 17x buttons, six of which offer click, trigger and finger tip actions. All backers will receive a mouse mat and a brushed aluminium cable cube. It's still possible to pledge $149 to receive the limited edition Kickstarter pack ($80 off), estimated to ship before the New Year. Seems a bit overkill with the gimmicks. The sensor is said to be one of the best, but 150 bucks for a mouse is very expensive. Analogue and re-mappable buttons I've found to be fairly limited use if you want to use your mouse as a mouse. Windows does up to Mouse5 as a button, and then you have to start borrowing keys from the keyboard. Which is fine if your game is setup correctly, but when you're back in Windows you jab the extra button on your mouse and it starts writing things. Analogue is a great idea, but what game supports the notion of variable inputs on keys? You can bind up the keys to a game controller, but then that's not going to work for a large number of inputs. The hardware is ahead of the software. Friend of mine has a *cof* IMac which has no buttons at all on it`s mouse. He used to work in newspaper production graphic design pre `wapping-gate` and is always banging on about the mouse he used then having sixteen buttons on it. No prizes for guessing what he`s getting for xmas from me this year. Hopefully one of these will shut him up. Still will get sniped by an invisible sniper in PS2 when you spawn! It's one of those things I would have to try before I buy, especially at that price. Does look interesting though.